The much awaited Maruti Suzuki Ignis is finally here. Launched at Rs 4.59 lakh, the quirky hatch had garnered quite a lot of eyeballs at the 2016 Indian Auto Expo and all through the year, enthusiasts were waiting for this Maruti hatch to roll off the assembly line. Do you know what’s the aspect that some Maruti Suzuki cars share in common besides the ‘S’ badge? Yes, it’s their engines. India’s largest passenger carmaker doesn’t play around with engines too often and has largely stuck to its tried and tested ones. The ultimate point of comparison is, whether using the same capacity engines and adding different body shells affect the fuel economy? Well, the answer lies below. Read on. The Maruti cars in question today are the newly launched Ignis, Swift, Swift Dzire, Baleno and the Ritz. Out of the five cars, the Ignis is the most affordable while the Baleno is the most expensive buy. All the cars are equipped with the same 1.2-litre petrol and a 1.3-litre diesel motors. 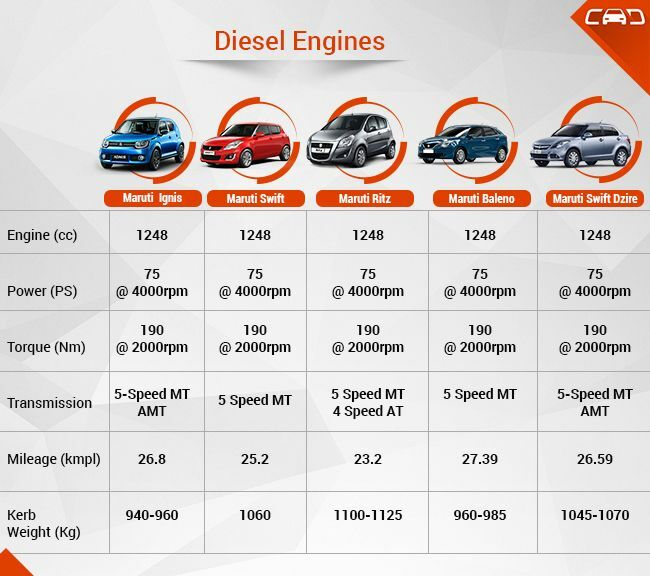 However, the fine tuning to these engines, gear ratios and transmissions help them yield slightly different fuel efficiency for different car models. 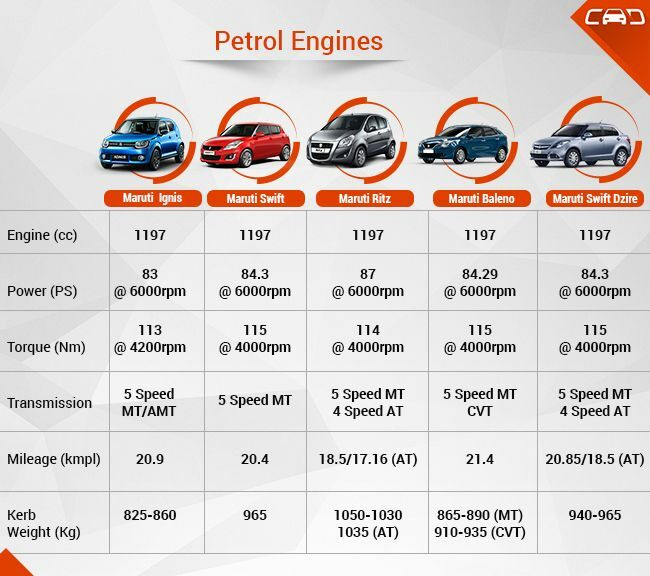 For instance, with the same petrol motor the Maruti Suzuki Ritz offers the least mileage– 18.5kmpl, whereas the highest is achieved by the Baleno – 21.4kmpl. The Ritz is the bulkiest of the lot (1030-1050kg), while the Baleno is the second lightest (865-935kg) in the comparo. Interestingly, among all the five cars it’s the Ritz which returns maximum output of 87PS, while others revolve around the 84.3PS mark. The heavier body and higher power output lead to a weaker fuel efficiency figure for the Ritz. The 1.3-litre diesel engine’s power figures are almost the same in all the five cars, however, the magic lies in the fuel economy figures. It varies to a great extent, with the least being offered by the Ritz – 23.2kmpl, and the highest by the Baleno – 27.39kmpl. Reason? It’s the same – heavier framework of the former and lighter of the latter.